This month, six former student-athletes will receive the NCAA Silver Anniversary Award recognizing their collegiate and professional achievements. 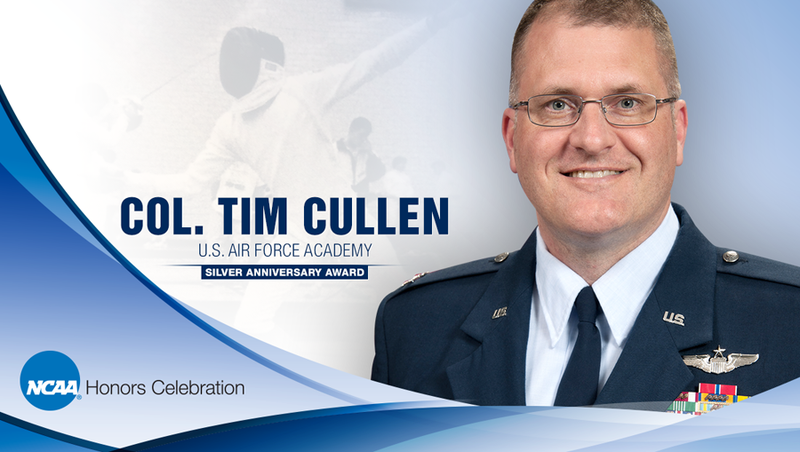 Among this year’s recipients is Col. Tim M. Cullen, Ph.D. (CO Z ’94) from the U.S. Air Force Academy. Dr. Cullen was a fencing student-athlete at Air Force, an NCAA All-American, and recipient of the 1994 NCAA Postgraduate Scholarship. He is a colonel in the Air Force and serves as the director of safety for Pacific Air Forces based at Joint Base Pearl Harbor-Hickam in Honolulu. According to the announcement, he was previously commandant and dean of the School of Advanced Air and Space Studies at Air University on Maxwell Air Force Base in Alabama. Galloway also serves in the Air National Guard as a cyberspace operations officer. She is pursuing a master’s degree with a research focus on photovoltaic materials for space applications. She joined TBP in 2018 and was integral in the process of Oregon Tech (OR Delta) becoming the 254th collegiate chapter of Tau Beta Pi. G.P. Bud Peterson, Ph.D. (KS G ’75), the eleventh president of Georgia Institute of Technology has announced his plans to retire. Dr. Peterson has served as president of Georgia Tech for the past ten years. Previously, he was selected in 2008 by President George W. Bush to serve on the National Science Board.